Community Event Celebrating JSU and the Jewish Future Join us for a delicious dinner hosted by the Nach-Zeitzer Family. Free for students. RSVP or sponsorship opportunitesat arizonancsy.org/jsu-dinner. Celebrate Israel’s 70th birthday with fun activities, cookie decorating and more! Members: Free; Guests: $5 per family of up to four; $2 per additional person. For more information, or to register, contact 480-659-7769 or earlychildhood@vosjcc.org. Yom HaShoah Service at Temple Emanuel of Tempe, 5801 S. Rural Road, Tempe from 2 to 4 pm. For more information, contact 480-838-1414 or emanueloftempe.org. “Along the Talmudic Trail” is an ongoing Talmud class for men ages 18-40, designed to move your mind and heart. This free class includes a free dinner. “Along the Talmudic Trail” is an ongoing Talmud class for men 40+, designed to move your mind and heart. This free class includes a free dinner. Please join us for a community observance of Yom Hazikaron – Israel Memorial Day – to honor the lives and memories of the fallen soldiers and the victims of terrorism. NowGen Happy Hour at Casa Amigos (Formerly Livewire), 7320 E. Indian Plaza, Scottsdale from 6 to 8 pm. 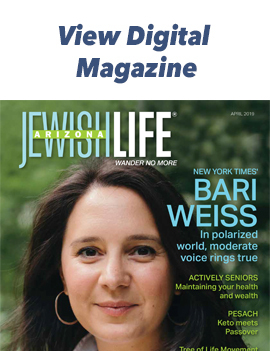 Networking and fun for Jewish young adults. 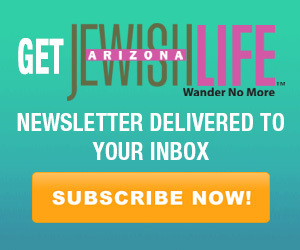 Register with Kelly Harris at 480-481-7010 or kharris@jewishphoenix.org. Yom Ha’atzmaut at the East Valley JCC at 908 N. Alma School Road, Chandler from 6:30 to 8:30 pm. Food and live music. $7 person, $20 family. 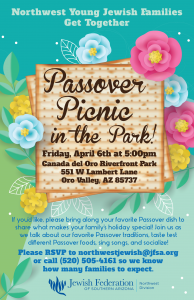 For more information, contact 480-897-0588 or events@evjcc.org. Wednesday April 25, 2018 Literary Ladies book choice is To the End of the Land by David Grossman. We will be meeting to discuss the book at Lois Zeidman’s house. Friday, April 27, 2018 Flick Chicks – Movie and time will be decided the Friday before the outing contact Barbara Ganz for info. Sunday, April 29 2:00 p.m. Kugel Kook Off at Ruth Kovac’s go the calendar on www.sljc.org to see flyer and rules.